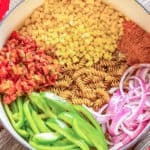 One Pot Wonder Southwest Pasta – Dinner in under 30 minutes in one pot! Pasta, black beans, corn, and bell peppers are spiced up with Rotel and taco seasoning. It’s an easy vegetarian meal. I’m obsessed with this one pot method for cooking pasta. And it seems like everyone else is too since my other one pot wonder recipes have been shared/pinned HUNDREDS OF THOUSANDS of times (Pasta Con Broccoli, Chicken Lo Mein). If you are not familiar with the one pot wonder method, you simply put uncooked pasta, veggies, seasoning, and broth into a large pot, cover it, and let it cook for about 12-15 minutes. That’s it! The pasta absorbs the cooking liquid and creates an almost creamy sauce. This southwest style pasta gets a spicy kick from a can of Rotel (tomatoes and green chilies) and taco seasoning. Sweet corn kernels and bell pepper provide a nice contrast of flavors. This dish is healthy without tasting like health food. It has lots of veggies, black beans, and whole wheat pasta so it’s packed with vitamins/minerals and fiber. If you’re not a fan of whole wheat pasta, regular pasta can be substituted. The main protein source in this pasta is canned black beans. So, it’s perfect for vegetarians and those people that practice Meatless Mondays (going vegetarian one day a week). One Pot Wonder Southwest Pasta - Dinner in under 30 minutes in one pot! Pasta, black beans, corn, and bell peppers are spiced up with Rotel and taco seasoning. It's an easy vegetarian meal. Add all but the last 2 ingredients (beans and cheese) to a large pot. Stir, cover, and bring to a rolling boil. Reduce heat to medium-low and cook, covered, for 12-15 minutes, stirring occasionally. There should be 1/4 to 1/2 inch of liquid in the bottom of the pot when it is done. Remove from heat. Stir in the black beans and cheese (optional). Let it rest for 5 minutes to warm the beans, melt the cheese, and absorb the excess liquid. I will be adding a little cream cheese in at the end to give it a little more creaminess!!! Can’t wait to try it!!!! Definitely just as good if not better the second day! This was awesome and super easy! I added chorizo and cilantro. Will definitely make this again soon. Thanks!! Thought I’d leave a few comments – the broth you use really matters in this recipe. I made it with the Trader Joes broth, which is really intense, so I would use half of a very strong broth and half water. I also used diced canned tomatoes and fire roasted green chillies, and cajun seasoning instead of taco seasoning. I’d say these adjustments worked very well… I would caution not to add extra salt because when I did, the dish became a bit unbearable. This was ASTONISHINGLY easy. I thought it would turn into a Pinterest fail when I saw how little liquid there seemed to be, but it was PERFECT. I used gluten-free pasta (a chickpea-based one) and it was done within about 8 minutes, and the pasta held up really well. Definitely adding to the rotation for a quick weeknight/busy night recipe! Very yummy recipe! I added extra taco seasoning, eyeballed the amount of broth put in, and added ground beef and me and my husband are loving it! I used chicken sausage and no beans. We loved it!! Thank you will definitely make again.